W3 Total Cache is a comprehensive caching plugin for WordPress that will dramatically speed up pageviews and consolidate page requests. WordPress works faster, and people who visit your page can do more in less time, with no downsides. It works so well, it is even used on this knowledgebase, kb.apnscp.com. Under Performance > General Settings > Import/Export, select Import configuration. Extract w3-settings.php from the attached zip file, select this file. Note: minification is enabled for logged-in users. If making changes to your theme, disable this feature via General Settings > Minify > Disable for logged in users enable. Upon success, “Settings successfully uploaded” will appear up top confirming install success. W3 Total Cache import success confirmation dialog. Unless explicitly stated, all other values should remain unchecked or default setting. Disk cache is preferred over APC/OPCache, because whenever the HTTP server is restarted to load new addon domain changes, the APC/OPCache is purged. Any cached files then would be lost. On high traffic sites, APC/OPCache would yield better performance by bypassing a file stat() and instead pulling from the cache from memory. 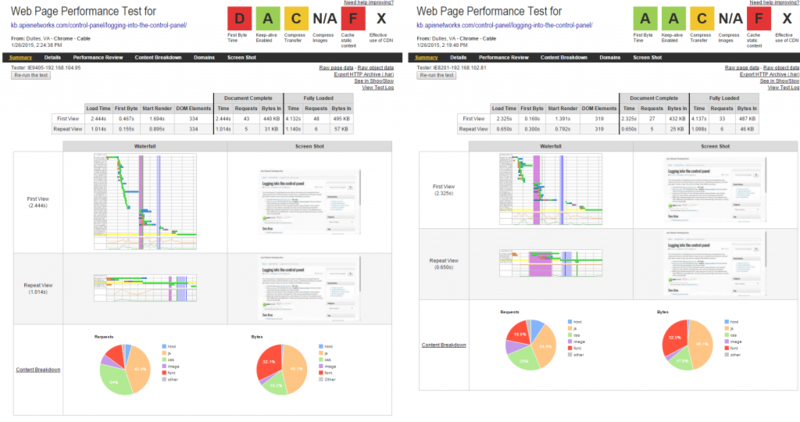 An analysis from webpagetest.org illustrates the performance gains before and after using W3 Total Cache. First byte time is reduced (processing the request) + number of requests has been reduced as well. A post processes 36% faster, and the page loads external assets (CSS/JS) 3.7% faster. With more plugins, the performance gains become greater when W3 Total Cache is activated. Page loads before and after caching on kb.apnscp.com. This entry was posted in WordPress and tagged php, wordpress.